Maryland chapter of the NWTF: National Wild Turkey Federation. 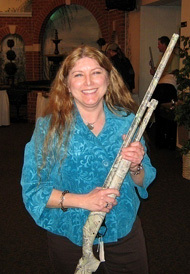 The NWTF Women in the Outdoors (WITO) program gives ladies the opportunity to learn something new. Maybe they never had the chance to go hunting with their fathers or brothers. Maybe they never lived in an area where you could fish. Whatever the reason, the NWTF Women in the Outdoors program provides a camaraderie atmosphere where women can learn new outdoor skills taught by instructors and volunteers from the local MD chapters of the NWTF. Click here for a great write up of the Central Maryland Chapter's June 12th WITO event!